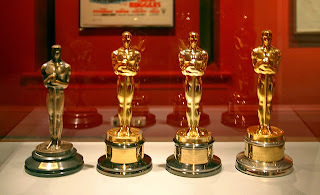 Hmm.... so the grand OSCARS this is year went as expected and most of the winners were almost quite easy to guess. Best movie 'Argo', Best Director 'Ang Lee' for 'Life of Pi', Best Actor 'Daniel Day-Lewis' for 'Lincoln', Best Actress 'Jennifer Lawrence' for 'Silver Linings Playbook' (though I would have voted for 'Jessica Chastain' for 'Zero Dark Thirty'), Best Animation movie 'Brave', Best Visual effects 'Life of Pi', Best supporting actor 'Christoph Waltz' for 'Django Unchained', Best supporting actress 'Anne Hathaway' for 'Les Misérables' and so on. Now here is the surprise, the most popular and successful movies last year 'Avengers' and 'The Dark Knight Rises' failed to get any OSCAR and top of it they were able to earn only one nomination. 'Zero Dark Thirty' even after so much acclaim and its controversial plot failed to create any ripples. No new debutante stars ever felicitated for their performances. No life time achievement award was given to anyone. So may be its time for OSCARS to re-invent magic and plug such voids because awards are not for few distinguished ones but for the gifted ones. It should propagate feeling of triumph rather than the feeling of loss.